A beautiful and healthy face has a "V-shape." But with the aging of tissues and the action of gravity, this "V-shape" gets lost. 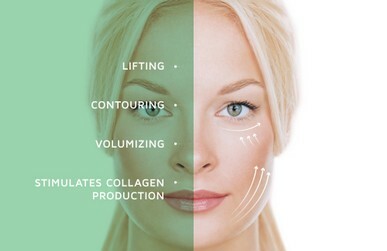 The idea behind the Nova-Lift technique is to either create a scaffolding in order to support the tissues and keep them in the "V-shape", or where necessary, to delicately lift the tissues and reposition the skin to recreate the "V-shape" where it’s been lost. The results of Nova Threads vary from patient to patient due to age, skin tone, and volume loss. The best way to determine if this non-surgical procedure is right for you is to request a COMPLIMENTARY CONSULTATION. Our Patient Care Coordinator will help you create a cosmetic plan and will assist you in making the correct choices. Although NOVA THREADS can be inserted / injected almost anywhere, one particular area that was missing a non-surgical procedure is the area of the jaw & the neck. With Nova threads, Dr. Mash is able to restore your youthful sculpted jawline without cuts or incisions. NovaThreads are needles that are pre-loaded with a "PDO" thread. Dr. Mash simply inserts a needleat subdermal level, parallel to the surface of the skin, & pulls the needle out. The nova thread remains under the skin. Thread lifts are extremely low risk, thanks to how noninvasive they are. There is virtually no risk of scarring, severe bruising, bleeding, or other complications after having a thread lift. In rare cases, patients may experience irritation, infection, or their sutures becoming visible under their skin. If this occurs, however, the sutures can simply be removed and the patient’s face will return to its prior state. Both been approved by the FDA for the purpose of lifting facial tissue. However, while these procedures rely on a similar mechanism of action and both produce excellent results, there are some key differences between them that patients need to be aware of. Nova threads are sutures that are made from a biocompatible material called PDO, which has been specially designed for safe re-absorption by the body. Nova threads remain in place for about four to six months, after which point they slowly dissolve. Patients can, however, expect to keep seeing the results of their Nova thread lift for a year or more after their treatment. This long-lasting effect arises from the lingering improvement in skin condition that results from collagen infusion. Silhouette Instalift relies on the use of biocompatible temporary sutures to lift the face. The Silhouette Instalift is more focused on lifting the skin than stimulating collagen production (though it will accomplish both objectives, of course), so the threads used during this procedure are designed somewhat differently. Rather than being smooth or barbed, they contain a number of sutures interspersed with tiny “cones” that are adept at grabbing tissue. This allows the threads to gather more skin, producing a more noticeable lift to the cheeks and jowls. Silhouette Instalift threads are designed to create fairly long-lasting results as well; patients can expect to enjoy the impact of their Silhouette Instalift for one to three years.